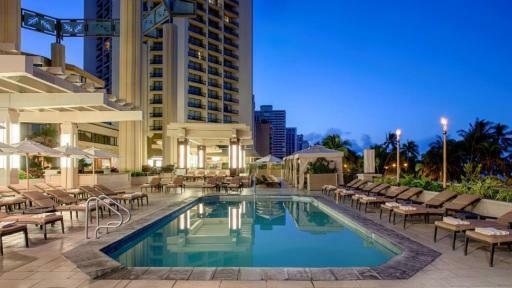 Set in the heart of downtown Honolulu, Ala Moana Hotel by Mantra is just minutes from the International Airport and offers modern accommodation that blends seamlessly with the beautiful tropical island. 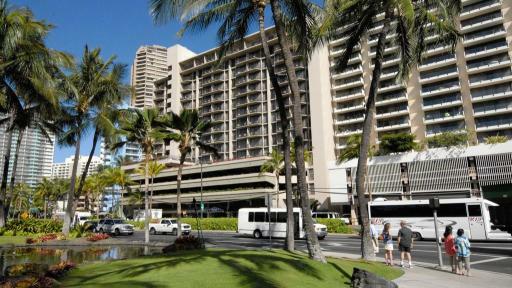 The resort enjoys an excellent range of facilities and is just a short stroll from more than 260 shops and restaurants at the Ala Moana Shopping Center. Located just a short distance from Waikiki Beach, Aqua Bamboo Waikiki offers self-catering rooms and suites as well a swimming pool, rock waterfall, BBQ area and more. Just a short drive to the International Airport, the resort is also conveniently located close to a range of bars, restaurants and shops. Just 10 minutes from Waikiki Beach, Aqua Palms Waikikia enjoys easy access to a range of attractions including Ala Moana Shopping Centre, a range of bars and restaurants and the Hawaii Convention Centre. 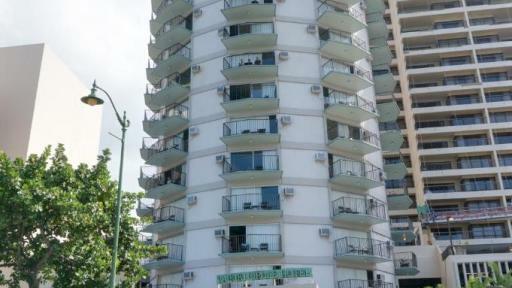 The resort offers self-catering rooms spread over 12 story's with a fantastic range of facilities. Set opposite the picturesque Waikiki Beach, Aston Waikiki Beach Hotel offers spacious, air conditioned accommodation with most rooms enjoying full or partial ocean views. 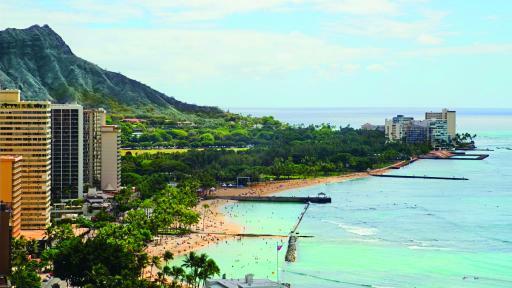 The resort is also conveniently close to local attractions including Hanauma Bay and the Waikiki Aquarium. Offering a friendly, home-away-from-home atmosphere, Aston Waikiki Circle Hotel features accommodation directly opposite beautiful Waikiki Beach. All rooms enjoy private lanais and beautiful views with a great range of shopping, dining and entertainment options close by. 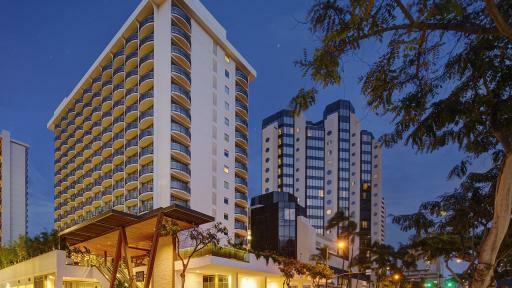 Aston Waikiki Sunset is the perfect Honolulu accommodation to relax and see all that Waikiki has to offer. 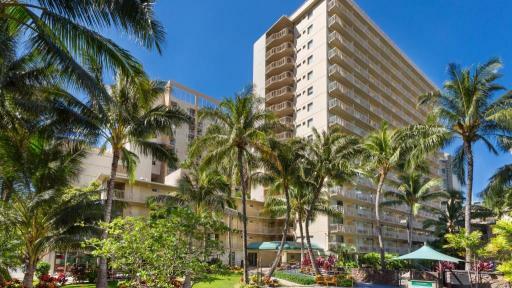 Just a block back from Waikiki Beach the property offers both 1 and 2 bedroom self catered apartments with views of Diamond Head, Honolulu City Lights and views of Waikiki Beach. Restaurants, the beach and major attractions are all just a short walk away from the hotel, the perfect base for your next trip to Hawaii. 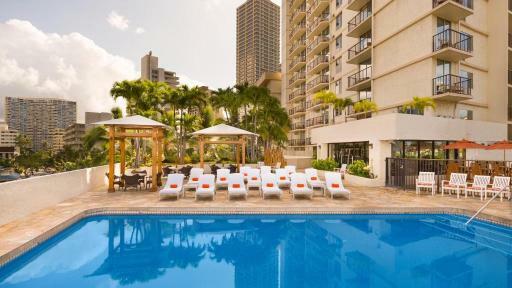 Just metres from Waikiki Beach, Courtyard by Marriott Waikiki Beach offers a number of guest rooms and suites with a fabulous range of facilities. The resort is also located within walking distance of an 8 acre outdoor entertainment complex with 50 retail stores and plenty of dining options. 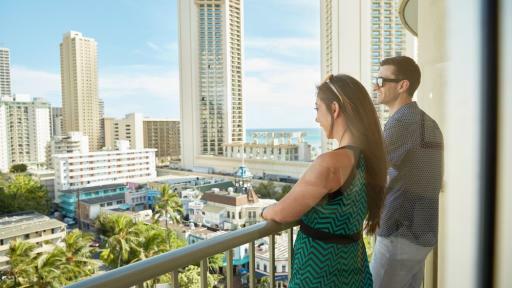 Located directly opposite some of the Hawaiian Island's best shopping, Embassy Suites by Hilton Waikiki Beach Walk offers stylish accommodation in a convenient location. The spacious 1 and 2 Bedroom Suite Apartments also enjoy access to a great range of onsite restaurants and leisure facilities. Set on the beautiful beachfront and surrounded by 5 acres of tropical gardens, Halekulani offers luxurious accommodation perfectly complimented by a fantastic range of facilities. Home to a large swimming pool, sundeck and range of bars and restaurants overlooking the ocean, the resort offers a relaxing stay. Located right on the beautiful Waikiki Beach, Hilton Hawaiian Village Beach Resort & Spa offers stylish accommodation spread across 22 acres of lush tropical gardens. 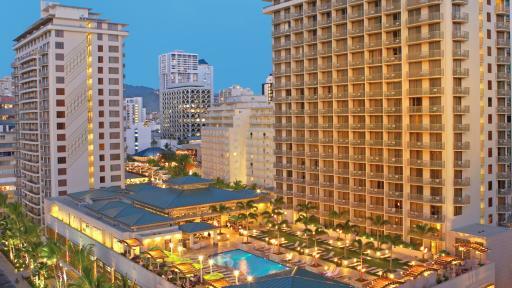 Home to the largest swimming pool in Waikiki, the resort enjoys access to more than 20 restaurants and plenty ofretail stores. 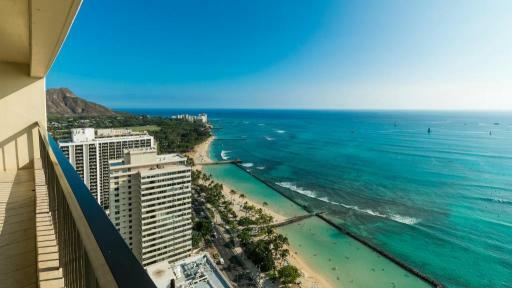 Centrally located to Waikiki Beach, Hilton Waikiki Beach offers spacious and comfortable accommodation with beautiful views of the Koolau mountain rage and Pacific Ocean. This popular resort also enjoys an impressive array of onsite facilities and leisure activity programs. 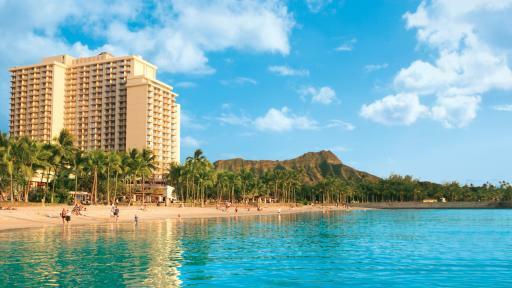 Positioned on the stunning Waikiki Beach, Hyatt Regency Waikiki Resort and Spa is just minutes from a range of local landmarks and attractions including Diamond Head, Waikiki Aquarium and Honolulu Zoo. The resort offers spacious accommodation and a family friendly range of facilities. Just a short stroll from Waikiki Beach, Luana Waikiki Hotel & Suites offers guest rooms, studios and suites close to the International Airport. Enjoy city, park or ocean views, the resort offers premium facilities and is close to a range of entertainment and leisure activities. Set on Waikiki Beach in an historic building, Moana Surfrider, A Westin Resort & Spa was originally known as the 'first lady' of Waikiki and offers all the modern comforts in Victorian style architecture. Enjoying an impressive range of facilities, the resort is also home to a number of onsite bars and restaurants. 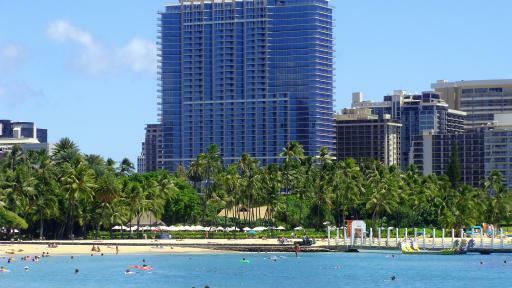 Offering affordable accommodation in the heart of Waikiki, Ohana Waikiki East by Outrigger is conveniently located close to a range of Honolulu's most popular attractions. Offering 441 spacious and comfortable guest rooms, each with their own private balcony, the resort enjoys a host of entertaining facilities. Close to Waikiki Beach, Ohana Waikiki Malia by Outrigger offers friendly service and comfortable accommodation ranging from spacious guest rooms to self-catering apartments. Close to a range of shopping, dining and entertainment options, the resort is a popular choice with visitors to the island. Situated on the famous shores of Waikiki Beach, Outrigger Reef Waikiki Beach Resort offers spacious accommodation with all the modern comforts. 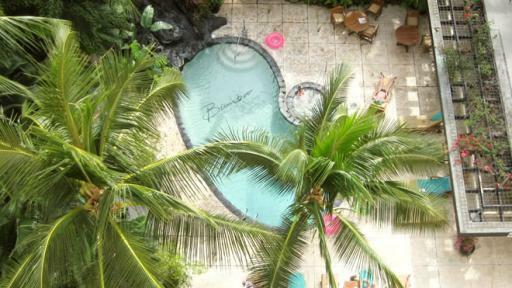 Offering a range of onsite bars and dining options as well as an outdoor pool, day spa and much more, the resort is a popular place to stay while visiting Honolulu. Located in the epicentre of Waikiki just minutes from Honolulu's International Airport, Outrigger Waikiki Beach Resort offers 524 guest rooms seamlessly blending modern comfort with tropical island atmosphere. Each room also enjoys its own private balcony or courtyard from which to enjoy the ocean views. Overlooking the scenic Ala Wai Yacht Harbour, Prince Waikiki enjoys stunning views of the Pacific Ocean and the iconic Waikiki Beach. With a great range guest rooms to choose from, the resort offers facilities including restaurants and bars, fitness centre, tennis courts and is just minutes from the golf course and Ala Moana Shopping Centre. 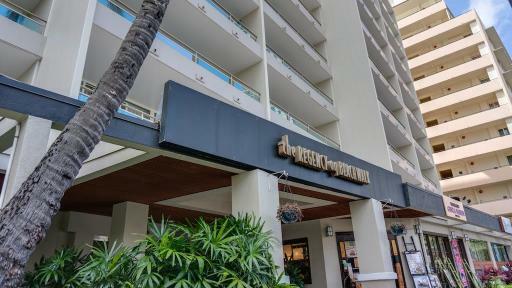 Offering stylish boutique accommodation central to Honolulu's shopping, dining and nightlife hub, Regency on Beachwalk Waikiki by Outrigger offers sophistication at its best. The private condos and residences provide an intimate atmosphere which are perfectly complimented by the deluxe facilities. 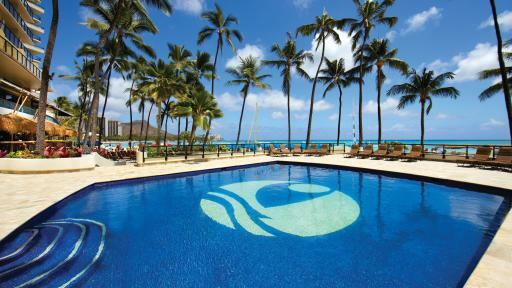 A long-time favourite, Sheraton Princess Kaiulani is affectionately known as PK and offers more than 1000 guest rooms. 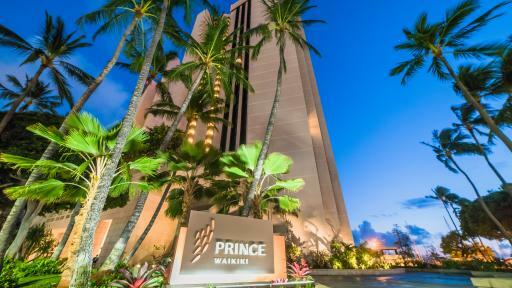 Conveniently located opposite Waikiki Beach and close to the shopping of Honolulu, the resort welcomes couples and families and enjoys a wonderful range of facilities. 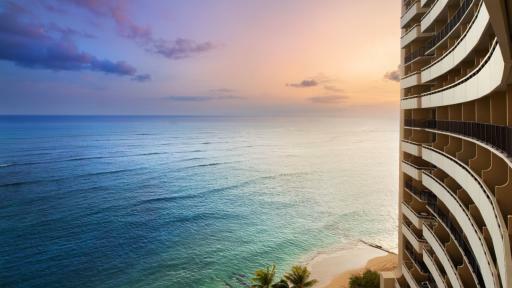 Set right on the gorgeous Waikiki Beach, Sheraton Waikiki offers oceanfront accommodation central to all of Honolulu's activities and attractions. Offering beautiful views of the city, mountains or ocean, the resort enjoys an excellent range of facilities including a fitness centre and day spa. 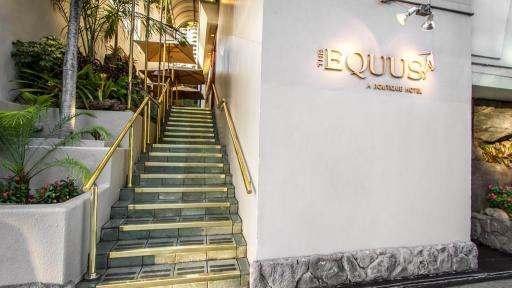 Offering sophisticated boutique accommodation in the centre of Waikiki city, The Equus is surrounded by tropical gardens and is within minutes of the main shopping strip. With an equestrian heritage, the resort features Ralph Lauren inspired décor and is close to a range of local attractions. 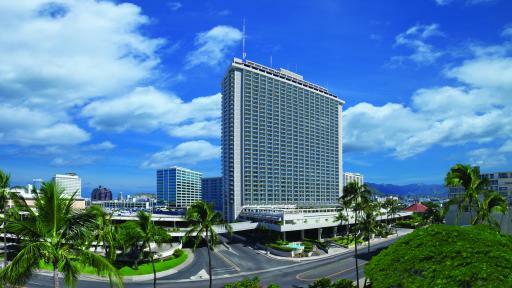 Set in the centre of Waikiki, The Laylow, Autograph Collection is right next door to the International Marketplace. Just minutes from the famous Waikiki Beach, the resort offers beautifully designed modern rooms and suites complete with private lanais and an excellent range of onsite facilities, all for an affordable price. 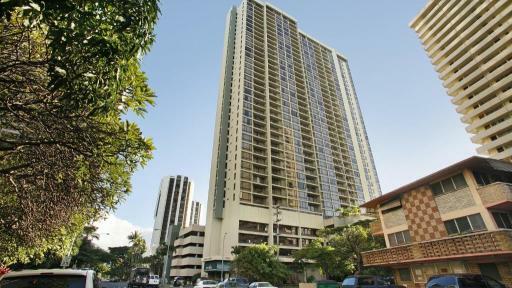 Enjoy hotel services and self catered apartment accommodation at The Residences at Waikiki Beach Tower. 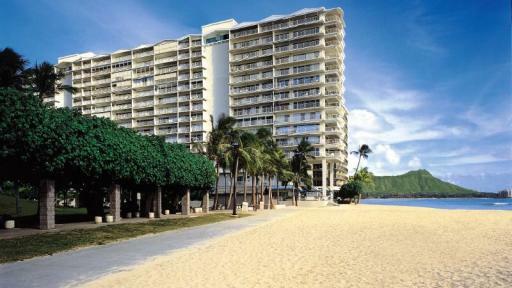 This Honolulu accommodation offers both 1 and 2 bedroom suites with breathtaking ocean views from every apartment. 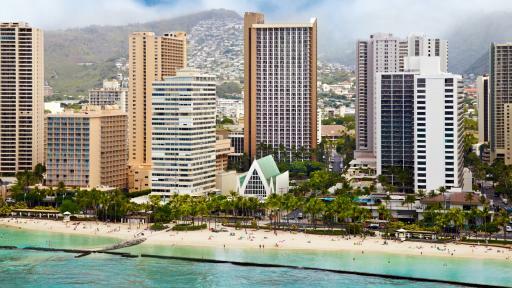 Most of Waikiki's popular attractions are within walking distance from the hotel. Located in the heart of Waikiki's main street are numerous dining options and located right across the road from famous Waikiki Beach. 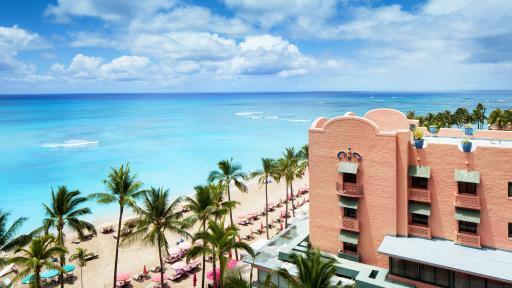 Accommodation fit for a king, The Royal Hawaiian, a Luxury Collection Resort offers panoramic vistas of Diamond Head and the Pacific Ocean on the shores of stunning Waikiki Beach. Featuring over 500 deluxe rooms, the resort enjoys a supreme range of onsite facilities to ensure that all of your desires are taken care of. This luxury Honolulu accommodation is the perfect choice for couples and families looking for five star rooms in a great location. 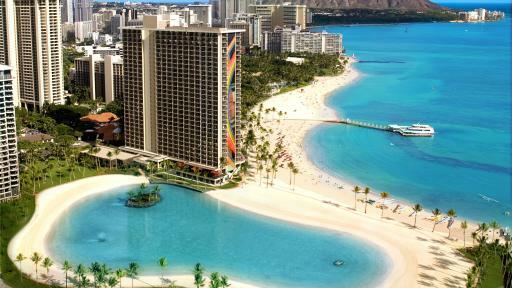 Trump International Hotel Waikiki just only moments from Waikiki Beach plus there are numerous shops, restaurants, bars, attractions, activities and entertainment that are close by. Choose from guest rooms and suite style self contained accommodation that is modern, spacious and has commanding views of the surrounding area. Enjoy wireless Internet access, an infinity swimming pool on the 6th floor, 24 hour fitness centre and a day spa. 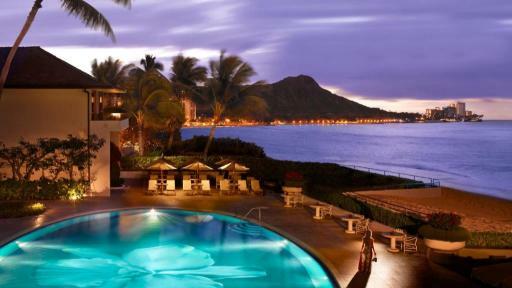 Relax, unwind an enjoy your next Hawaii holiday at Trump International Hotel Waikiki. 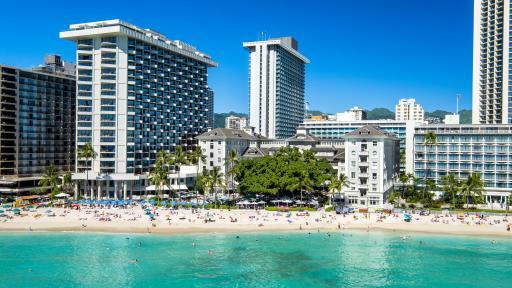 Located on Kalakaua Avenue, Waikiki Beach Marriott Resort and Spa is just seconds from the region's famous shopping, dining and nightlife. Directly opposite the golden sands of Waikiki Beach, the resort boasts over 1000 guest rooms complete with amazing views and superior facilities. 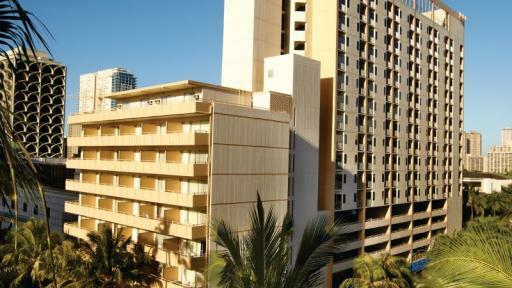 Accommodation at Waikiki Beachcomber by Outrigger enjoys lovely ocean views, modern facilities and a convenient location. 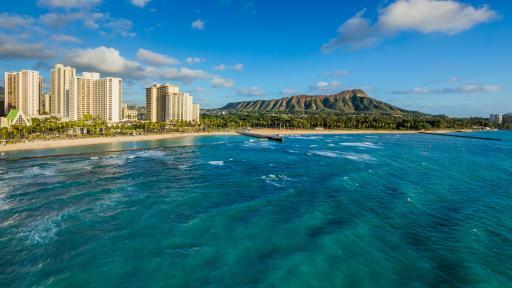 Set in the heart of its namesake, the hotel is close to Diamond Head, local attractions and a range of shopping and dining options making it the ideal place to base yourself on the island. 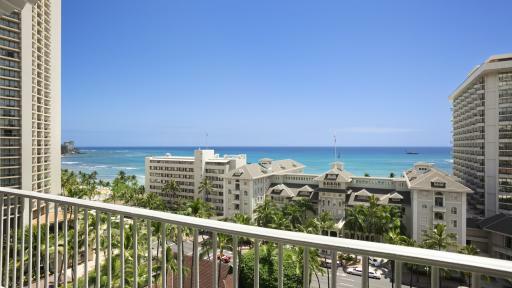 Overlooking Waikiki Beach and the Pacific Ocean, Waikiki Shore by Outrigger offers comfortable accommodation complete with self-catering facilities and their own private balcony. Just metres from shopping, dining and nightlife, the resort enjoys a great range of onsite facilities.